Doll Bicycle Seat - "Ride along Dolly" - Purple Sear Edition - is the perfect way to show your loved doll a good time. No longer do you have to leave your doll at home. Take your doll along on a fun-filled afternoon bike ride around the neighborhood. Super Easy to attach to any bicycle, and sturdier than other seats with a unique Bar Attachment and bolt included. Also includes seat belt so your doll can be just as safe as you. 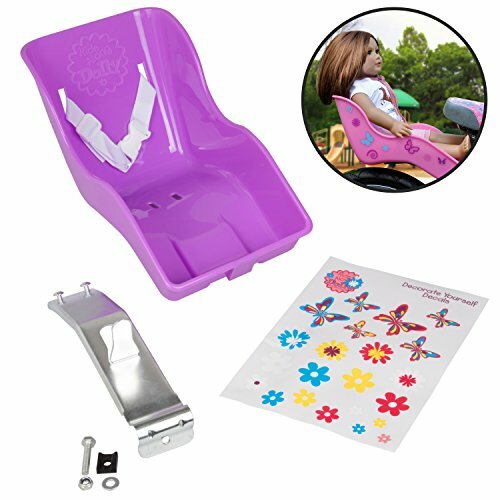 Fun Girl-themed decals adorn his pink-a-licious colored doll bike seat for added fun. Affordably priced versus other name brands like Dolly Come ride with me, Ride along Dolly is the perfect gift for any doll enthused young girl. Fits virtually all standard sized dolls up to 3 lbs, including American Girl Dolls, Corolle Dolls, and stuffed animals. NOTE: Ride Along Dolly WILL fit on any bike with the standard rear crossbar with a hole, found on any bikes. It does not matter if you have a rear brake or not. The seat is designed to work around such brake cords without compromising Bike or Seat performance. Ride Along Dolly is not affiliate with or endorsed by American Girl LLC and references their company purely for illustrative purposes only.